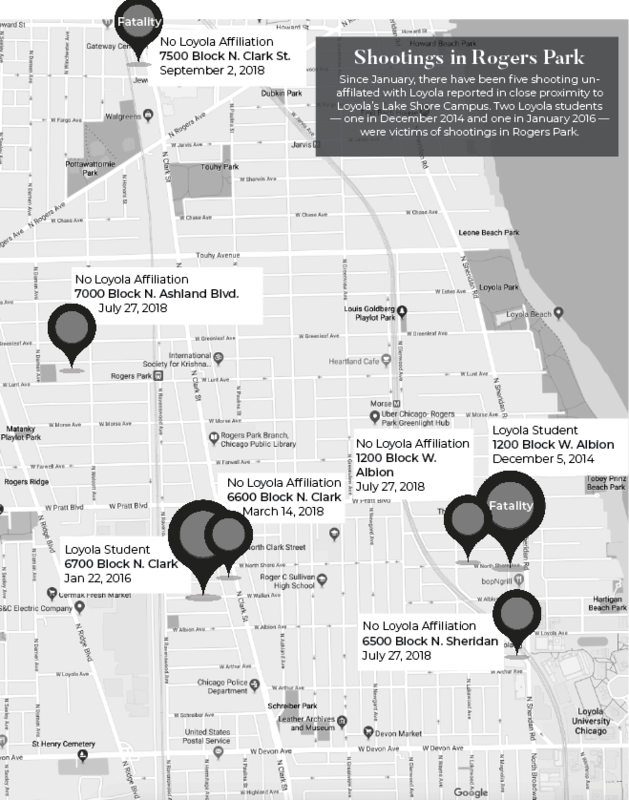 Since January, there have been five shooting unaffiliated with Loyola reported in close proximity to Loyola’s Lake Shore Campus. Two Loyola students — one in December 2014 and one in January 2016 — were victims of shootings in Rogers Park. A Northwestern doctoral student was fatally shot Sunday night on North Clark St. in Rogers Park, according to Chicago Police Department (CPD) news affairs officer Christine Calace. 25-year-old Shane Colombo was waiting at a bus stop when he was caught in an exchange of gunfire between two men near the 7500 block of North Clark St. around 8:25 p.m, police said. This is the most recent shooting in a series of similar incidents in Rogers Park. In late July, three shootings in two consecutive nights left three hospitalized. Colombo was taken from the scene in an ambulance and was pronounced dead at Presence St. Francis Hospital, where he died of multiple gunshot wounds, according to the Cook County medical examiner’s office. An email to students from Northwestern officials described Colombo as “a promising student” who was moving from New York, where he had been doing research at Columbia University. 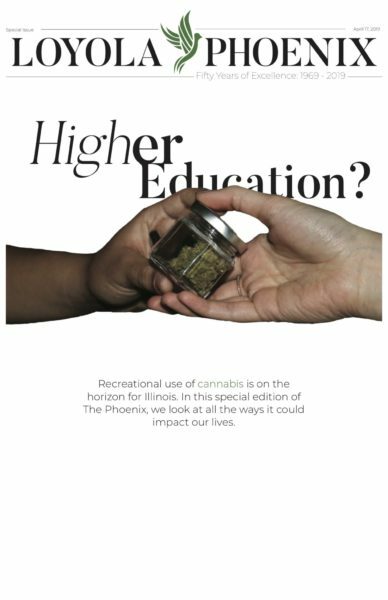 He was preparing to enter the university’s Psychology Ph.D. program in the fall, the email said. 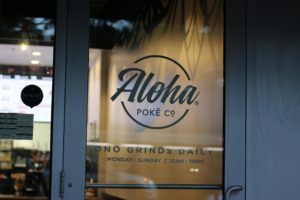 “This is a terrible loss for our community, and we all feel grief and heartbreak for Shane and his loved ones,” the email said. In the email, Northwestern officials said many of the university’s students and staff live in Rogers Park. Two Northwestern administrators said they themselves live in or near Rogers Park and condemned the violence. The shooting, which occurred close to two miles from Loyola’s Lake Shore Campus, was not within the patrol boundaries of Loyola Campus Safety. Police said no other injuries were reported and no one has been taken into custody. Area North detectives are still investigating that incident, police said. The area surrounding Loyola’s Lake Shore Campus has seen its share of gun violence in recent years; the bloodshed has occasionally touched the Loyola community directly. In February 2016, 19-year-old Khrystyna Trinchuk was shot outside her apartment in the 6700 block of North Clark St. Police later said she was the unintended target of a gang-related shooting — much like Colombo. Trinchuk survived, and returned to school at Loyola after recovering from her injuries. The person who shot her was never arrested, police said. Lakewood avenues —just blocks from Loyola’s Lake Shore Campus — when two men tried to rob them. Rauf was shot twice and died on the scene, police said. Like Trinchuk’s shooter, Rauf’s killer was never found, police confirmed. And in October 2017, Loyola student Maggie Nelson was standing on the street just 20 feet from a man who opened fire at another man in a car. That shooting took place near the same intersection where Rauf was killed: the corner of Albion and Lakewood avenues. Loyola Campus Safety couldn’t be reached for comment by the time of publication.